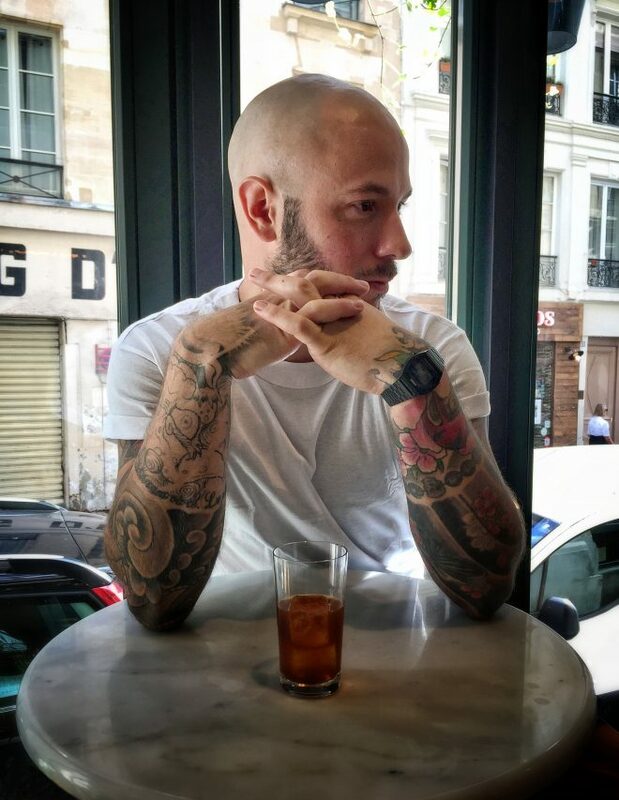 My name is Ben Tyler and I’m the head bartender at a restaurant named Bonhomie, which opened in Paris a year ago. I started bartending twelve years ago in Le Queen nightclub, then I moved back into the fashion industry momentarily until I met Greg Erchoff who used to work at the Park Hyatt Paris-Vendome and he taught me about classics, garnishes and service. I decided to return to the bar world in a more serious way and joined Le Fumoir in Paris. Afterwards I moved to Japan for two years where I learnt a lot about service. On my return home I worked at Maria Loca and whilst at a competition for Diplomatico rum I met Remy Savage who I then worked with at Little Red Door (he is a major influence on the way I work now) and sometimes worked at Lulu White with Matthew Long (who is a very strong bartender as well). After working with these guys I finally became the head bartender at Bonhomie, the company’s latest venture. I like the idea of finishing my life by the sea, so I’d create a small beachfront bar in the Caribbean. It would have a big garden behind it where all the fruits and vegetables for our drinks were grown. The focus would be on rums, amaros and little bit of mezcal. The idea of the bar would be guests could work in the garden to tend or pick the produce, which the bartenders would make into drinks or fish on the beach and their catch would be barbecued by the chef. I like old popular dive bars in the 10th or around Pigalle. Otherwise, I spend time with my family. I like rum, it’s like a first love for me. Michael Landart from Maria Loca is an encyclopedia when it comes to rum and he got me into it. I prefer agricole rum because it’s more raw and patrimonial and I especially like the ones from Martinique. Of course it’s about balance, but you should like the drink so much you want a second one straight after the first. There are always trends people tend to follow… like smoked drinks, clarified drinks and fermentations. But at the moment I am enjoying going back to the basics. Easy cocktails with very few ingredients and with this in mind I really like amaro’s at the moment as they are powerful, dry and very herbal. I am using a lot of China China or Amaro 8 right now. Go to Gravity in Paris and Limontour in Mexico City.